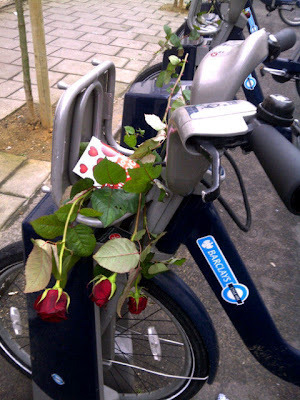 Courtesy Kennington People on Bikes blog. For more info click here. "If we are to get the improvements we need, we need to avoid coming across as shrill or entitled. Not all cycle safety campaigners manage this, frankly. And if cycling is to become a genuinely mass means of travel, as it is in Germany or the Netherlands, with the mass political clout that entails, we mustn’t needlessly scare off the parents and the grannies and all those people you see cycling over there, but never over here." I sense that Gilligan thinks my blog can sometimes be a little shrill. And in a way, sometimes it can. Largely because I try to point out the dangers being designed into our roads and to show how those often lethal designs are the result of policy decisions by the Mayor or by local authorities. Although I disagree with Gilligan that we might 'scare off the parents and grannies' - in the London I live in most of the grannies or mothers with kids already seem to be scared off zipping about on bikes - he is right to say that only when these sorts of people think using a bike is something they want to do will there be sufficient mass political clout to shift 'cycling' from a niche to an everyday issue. And in a way, those of us who use bikes at the moment are a small (albeit growing) niche. We are given only the odd niche bits of infrastructure on London's roads too. In fact, we're caught in a sort of trap where Transport for London doesn't seem to understand how to make roads that anyone and everyone would feel safe to use on a bike and instead tries to address the issue of 'cycling' by adding a few niche bits of infrastructure here and there. 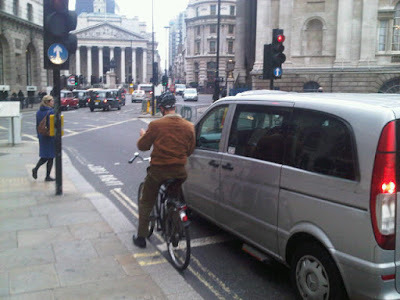 Transport for London tends to slot safe cycling as a kind of niche around its day job, that of moving as many motor vehicles around the city as possible. It's all slightly self-reinforcing. This has been going on for years. A decade ago, the London Cycle Network was in full swing. Although much of that network is still very useful, you need to be a pretty dedicated 'cyclist' to know where it is and how to use it. For the most part, it's very very niche indeed. I'd point out that under the last Mayor, Ken Livingstone, grand plans were floated for 'de-niching' the London Cycling Network and making it something much more useful. Never happened though. And so I can understand why Boris Johnson scrapped most of the funding for the London Cycle Network and went for the Cycle Super Highways instead. They're big, loud and you can't miss them. On the surface, at least, the Cycle Super Highways sound incredibly sensible. Unfortunately, much about the Super Highways has been deeply compromised, sometimes fatally so. Again and again, Super Highways wimp out exactly when you need them - at major junctions, or alongside multiple lanes of fast-moving motor traffic. The result is that the Mayor has replaced one niche solution with another. No wonder most Londoners still don't see bikes as just a normal way to travel in London. After four years of Boris Johnson's 'cycling revolution', there still isn't a single obvious and safe route through central London for people to use on their bikes and the 'revolution' seems to be confined to only some blue paint that helps commuters cycle to work during a three hour window each day. That's to the detriment of all of us, whether we sit in congestion in buses, taxis and cars; whether we live on residential streets turned into rat runs; whether we wonder why our high street shops are shutting down in favour of large out of town retail outlets (that people drive to) or whether we want to use a bike to get around at night or to the shops or to school. Gilligan is right to say that we need to think bigger than this. In particular, we need our politicians to think bigger than this. Next week, MPs will meet next week to debate the issue of making our cities fit for cycling - a debate that has been made possible thanks to the noise generated by The Times's Cities fit for cycling campaign. So far, the responses I've seen from MPs have been varied. Shadow Transport Secretary Maria Eagle has been very supportive, as has Julian Huppert (LibDem) who tabled the early day motion on the topic - the first serious debate on cycilng as a mode of transport in 16 years. My own local Labour MP in Lambeth has sent mixed messages and the Conservative MP for Westminster and the City of London has indicated he is not supportive.Four other Conservative MPs have sent this identical letter which you can see here. I don't think it's good enough that MPs believe the issue is simply one of the relative merits of mirrors, advance traffic lights or other niche ideas about how to make cycling a viable mode of transport. I want MPs to realise the debate is about something much bigger than that. It's about creating an environment where we give people space to get about that is not entirely dominated by the private car. One campaign that I think has started using this sort of language is the launch last week of the London Cycling Campaign's Love London Go Dutch effort. This is a campaign that is focussed entirely on making London the sort of place where grannies and mums with kids can get about more easily and safely by bike and not just by car. According to research by the Campaign, 81% of mothers said they could be encouraged to cycle and favoured safer bikes lanes or safer junctions and roundabouts to help them do so. 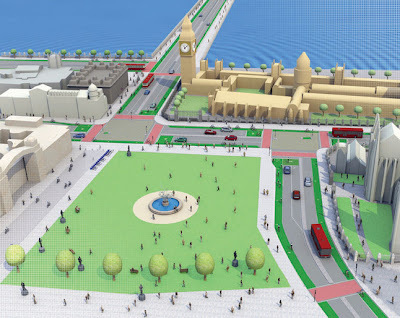 Pictured above, the LCC's vision for Parliament Square. Sponsored by Brompton Bicycles and supported by the Dutch Embassy, the LCC is aiming to show how the Mayor could create "more people-friendly streets where people work, shop and live".To that end, the Campaign is hosting a mass bike ride on April 28, designed for all Londoners from young to old. It is also building a petition that states: "I want the mayoral candidates to pledge to make London more liveable for everyone by making our streets as safe and inviting for cycling as they are in Holland” You can sign the petition here. The point I'd like to make to MPs and to our Mayor is that they can choose to make London and other cities more liveable and more easily accessible for everyone. It's up to them to start talking about this from a policy-making perspective. Bike being used yesterday for its true purpose? It is in that context, that several of us have decided next week is time to host another flashride. Our intention is not to be 'shrill or entitled'. Our intention is to focus the minds of our MPs and our Mayor. We want to encourage MPs to attend the debate and to listen to the actual issues, not spend three hours talking about the odd niche solution here and there. In fact, what I'd really hope for is a realisation that to really make it possible for 'grannies and parents' to get about by bike, requires people in senior political and policy roles to own targets to achieve just that. The police are providing support, there will be marshalls helping us on the way, a number of MPs have expressed support, the London Cycling Campaign is in support and ibikelondon blog has a well-argued post with more details here. We'll head down the Mall, along Horseguards Parade, around Parliament Square to Lambeth Bridge, along the south to Westminster Bridge, back round Parliament Square up Whitehall to Trafalgar Square, through Admiralty Arch back to the steps. Please join us. It's not a protest. It's not even about 'safer cycling' per se. It's a polite but forceful request to our MPs and to the Mayor to listen to and think about the bigger picture : to make our cities places in which we can live and get around more easily and healthily for all of us and not simply kick around issues of more bike training, more bike mirrors and other niche solutions that won't change the current status quo. And to encourage MPs to attend the debate taking place the next day. If you haven't already, it's not too late to write to your MP as well and ask them to attend the debate on 23rd February. You can email your MP using http://www.writetothem.com/. Mark at ibikelondon has a useful template email you can send at this link here but it's always best if you can send a personal email that explains why you think it's important that they take cycling seriously. The problem is, is that incorporating cycling and making streets 'liveable' means different things to different people. The Times campaign is a huge conflicting mess of opinion based around the idea that the best way to make cycling safer is to 'get cyclists out of the way' where possible. What would be much more welcome would be a research led approach, particularly as it has been proved in studies by the DFT and TRL that most problems with cycling aren't infrastructure based but attitudinal. But why ask people to challenge preconceptions when you can just stick a few token cycle lanes in? 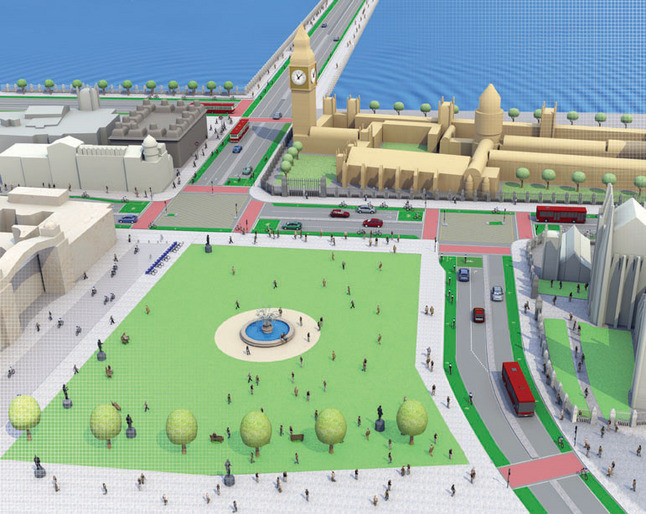 Of course Parliament Square is one of the LCC's first "Go Dutch" proposals, aimed not only at improved cycling environment but also conditions for pedestrians and the restoration of the square as a public space. While I admire the Times staff for their campaign - I guess they are starting to get off their knees as they sense that their proprietor is grievously, maybe mortally wounded - it doesn't entirely tick my boxes. It does seem like a much-improved "hierarchy of provision", in short solution-led, having preferred solutions which you try to shoehorn into every situation and only moving on to less favoured solutions where the favourites just won't fit. The Dutch (and Danish) approach as I understand them is to analyse the situation first, and then figure out the right, tailor-made, solution for what you actually find. There may be some fairly obvious conclusions to be drawn from that, such as separation where traffic speeds and/or volumes are high, and integration, "naked street" and traffic calming where they are low, but it is more subtle than that. "proved in studies by the DFT and TRL that most problems with cycling aren't infrastructure based but attitudinal"
All the studies I have ever seen, if they ask the right questions, show exactly the reverse. They show the problem is fear of motor traffic (as the recent Times survey shows, yet again). Therefore the solution is the infrastructural separation of cyclists from motor traffic, Dutch-style. Nobody is asking for "a few token cycle lanes". Certainly not LCC. You are the only one mentioning "token cycle lanes". You are right that making streets "liveable" means different things to different people. But LCC, in it's "Going Dutch" campaign, is making it clear what sort of model is being favoured. I sense you are opposed to this. OK, but I think the evidence is against what you say. Your link to the location doesn't work. Great initiative all the best from Nairobi, Kenya.